Užice-Ponikve Airport (IATA: UZC, ICAO: LYUZ) (Serbian: Аеродром Ужице-Поникве / Aerodrom Užice-Ponikve) also known as Lepa Glava (Literally: Beautiful Head) is an airport in the western part of Serbia. The airport is located at Ponikve (Literally:Sinkholes) plateau: 11 km (7 mi) east from the Mount Tara, 12 km (7.5 mi) northwest from the city of Užice, 13 km (8 mi) southeast from the town of Bajina Bašta, 16 km (10 mi) north from the town of Čajetina, 17 km (10.5 mi) northwest from the town of Sevojno, 19 km (12 mi) northeast from the popular tourist center with unique attractions of the Mokra Gora, 20 km (12.5 mi) north from theMount Zlatibor, 20 km (12.5 mi) southwest from the town of Kosjerić, 27 km (17 mi) northwest from the town of Požega, 32 km (20 mi) southwest from the mountain resort Divčibare, 35 km (22 mi) northeast from the town of Višegrad in Republic of Srpska (BiH), 36 km (22.5 mi) northwest from the town of Arilje, 39 km (24 mi) north from the town of Priboj, 45 km (28 mi) southwest from the city ofValjevo, 50 km (31 mi) northwest from the town of Nova Varoš and 56 km (35 mi) northwest from the town of Prijepolje. The airport in this moment is partially reconstructed in order to become a civil airport. Užice-Ponikve Airport was built in the period from 1979 to 1983 but until 1992 it hasn’t been actively used. After airport in 1995 turned into the public airport in 1996 and 1997 Jat Airways, then known as JAT Yugoslav Airlines, served the airport twice a week for a domestic round line Užice - Belgrade - Tivat - Užice, with an ATR 72 turboprop airliner. Part of the Motel “Kadinjača” close to the Kadinjača Memorial Complex about 4 km (2.5 mi) from airport, is temporarily adapted into terminal for receiving and outgoing of passengers. Passengers transported directly to plane by bus. Operations ceased in 1998 as the number of passengers reduced greatly. Ponikve airport was heavily bombarded by NATO forces during the 1999 NATO bombing of Yugoslavia. The airport now has a brighter future with construction/reconstruction, due to interest of local companies in cargo transport and great potential of this region in tourism. In the airport vicinity are some of the popular tourist attractions and ski centres (Zlatibor mountain, Tara mountain), also the Šargan Eight - famous narrow gauge railway and Drvengrad (Literally: Timber Town) at Mokra Gora (Literally: Wet Mountain). On September 27, 2006 it was announced that Ponikve Airport would be sold and converted for civilian use. Belgrade Nikola Tesla Airport is investing 3.5 million Serbian dinars for the completion of the runway reconstruction at Ponikve Airport. As earlier agreed, they will provide financial and logistics support in order to create conditions for civil air operations fromUžice, as soon as possible. The management of Belgrade Nikola Tesla Airport also plans to make Ponikve its cargo base for the western Serbia region. The runway at Ponikve is 3,200 metres [10,499 ft] in length after reconstruction. Originally it was to be 3,400 metres [11,155 ft]. The long runway allows Ponikve to accept large cargo aircraft. The low air pressure at this altitude makes a higher takeoff and landing speed necessary, and therefore a longer runway. It is among the longest runways in the Balkans, and the second longest in Serbia. The Government of Serbia also supported reconstruction works with 2,5 million euros, reconstruction commenced on the 24th of July, 2006 by the “Putevi Užice” company, while the EU invested 124,000 euros. The work on preparing the Ponikve Airport for civilian traffic started in 2011. It was also announced that the whole work of preparing Ponikve Airport for civil flights should be completed in 2013. The airport is officially opened on 5 October 2013 in the framework of the celebration of the City day. Visitors, among other things, have the opportunity to enjoy a performance of parachute jumps from a An-2 plane, demonstration flight of the Serbian Air Force, aircraft J-22 Orao, G-2 Galeb and Gazela and Robinson R22 helicopters. Flight program last until 2:10 pm and closed with parachute jumps. Currently operable runway length from its threshold 11 is 2,200 m [7,218 ft], which is enough for operations of 130 passengers aircraft class. After runway lengthening to 3,400 m [11,155 ft] and widening to 45 m [148 ft] the airport will be capable to handling Boeing 747 cargo aircraft class. More 5 million euros is needed to complete the reconstruction of the airport. After this, the airport will have potential to handling large aircraft. The protection fence around the airport in length of about 6 kilometers will be donated by Belgrade Nikola Tesla Airport after the reconstruction of his fence will be finished. Rest of the fence to needed 9.7 kilometres will be financed by City of Užice. 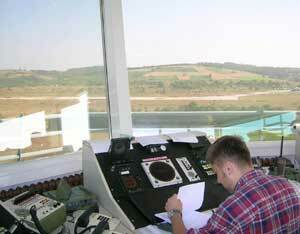 In morning of 21 October 2013 the Užice-Ponikve Airport greeted the first international civil flight. Around 8:45 on the runway landed Cessna Citation CJ3 with two crew members and five-member delegation of businessmens from Brussels. Same day in afternoon hours Business jet went to the Thessaloniki. Užice-Ponikve Airport is involved in the “Regional Airports Interaction for Regional Development” project , organized by CADSES INTERREG cooperation program. The aim of the project is strengthening of integrated and sustainable regional development based on the creation of a flexible air transport system provided by a cooperation network between regional airports. Beside Užice-Ponikve Airport, airports involved in the project are another 7 regional airports in Greece: Volos/Nea Anchialos-Central Greece International Airport, Hungary: Szombathely-Savaria International Airport, Slovakia: Žilina Airport, Poland: Slupsk-Redzikowo Airport, Italy: Ancona-Raffaello Sanzio Falconara Airport, Germany: Karlsruhe/Baden-Baden Airport and Ukraine: Ivano-Frankivsk International Airport.